On Sunday, November 25th the Russian and Ukrainian navies engaged in a small skirmish in waters off the coast of Crimea in the vicinity of the Kerch Strait. The Russians announced a stoppage of commercial traffic through the Kirov Strait – halting vessel movement between the Black Sea and the Sea of Azov. The strait was blocked by the Russians with a large oil tanker. This denied access by commercial ships to Ukrainian ports on the northern coast of the Sea of Azov. The incident seems to have begun after the Russians rammed a tugboat earlier in the day. This was followed by the Russians damaging an artillery boat and wounding six Ukrainian sailors. 23 Ukrainian sailors are held captive at this time. 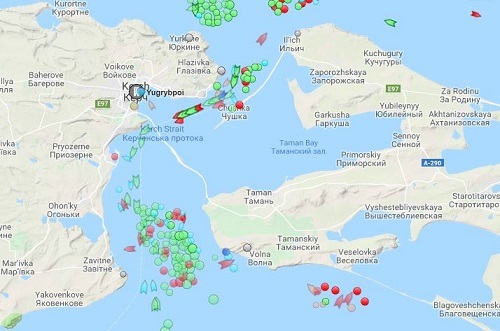 The three Ukrainian boats attempted to pass through the Kerch Strait from the Black Sea into the Sea of Azov but were intercepted by Russian Federal Security Service (FSB) Border Guard vessels. Photo: Two Gurza-M class artillery boats. (Photo by Ukraine MoD). Both Russia and Ukraine have equal rights to transit the waters leading to the Sea of Azov based on a 2003 treaty on the use of the Sea of Azov and the Kerch Strait. Other agreements on the maritime navigation of straits include the United Nations Law of the Sea Convention of 1982 and the Montreux Convention Regarding the Regime of the Straits of 1936. The European Union, NATO, and other international organizations have condemned the Russian action. The United Nations has scheduled an emergency meeting for Monday, November 26th. By closing the Kerch Strait Russia will effectively make the Sea of Azov a Russian maritime region despite the long Ukrainian coastline along the Sea of Azov and two Ukrainian commercial ports of Mariupol and Berdyansk on the Sea of Azov. In 2014 Russia illegally annexed the Crimean peninsular – taking the Ukrainian territory and making it part of Russia. Ukraine’s large naval base of Sevastopol on the Crimean peninsular was taken over by the Russians. Moscow built the Kerch bridge which connected Crimea with the Russian mainland. Many Ukrainian naval ships were also captured as well. So it is fairly certain that the Russian Black Sea Fleet would make short work of the Ukrainian navy if the situation escalates. Since the annexation of Crimea Russia has also made inroads into eastern Ukraine as well. This has heightened the awareness of NATO to possible Russian aggression in eastern Europe and the Baltic States. The events in the Kerch Strait is an escalation of the ongoing conflict between Russia and Ukraine. Russia’s moves are incremental in nature but in time they become big game-changers. Watch a 2 minute long video of a Russian Coast Guard ship ramming the Ukrainian tugboat. Posted on Facebook by Ukrainian Interior Minister Arsen Avakov. 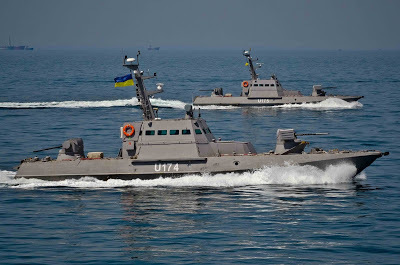 See info on the Gurza-M artillery boats of the Ukrainian Navy in “Gurza-M class small armored artillery boats of the Ukrainian Naval Forces”, Naval Analyses, November 17, 2017. See “Ukraine Considering Martial Law After Russia Opens Fire on Black Sea Ships”, Radio Free Europe, November 26, 2018. The Crimean Bridge – also known as the Kerch Strait Bridge – spans the Strait of Kerch at its most narrow location. Planning for the bridge began in 2014 after the Russians illegally annexed Crimea. The bridge provides for traffic between Crimea and the Russian mainland. It also makes it much easier for the Russians to close the Kerch Strait. The road bridge opened in the spring of 2018 while the rail bridge will open in 2019. Naval Capabilities – Sea of Azov, Covert Shores, November 25, 2018.